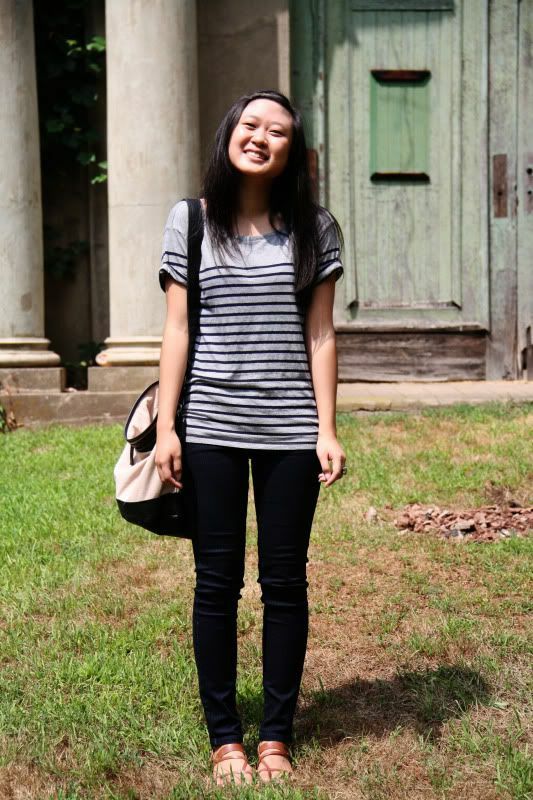 So this is me, in skinny jeans, in 90+ degree weather. I ventured to a park about 20 minutes away with my summer time photographer (who I've just lost to an internship in NYC) so we could go paddle boating! We started off in the wrong part of the park which is shown in this photo shoot. 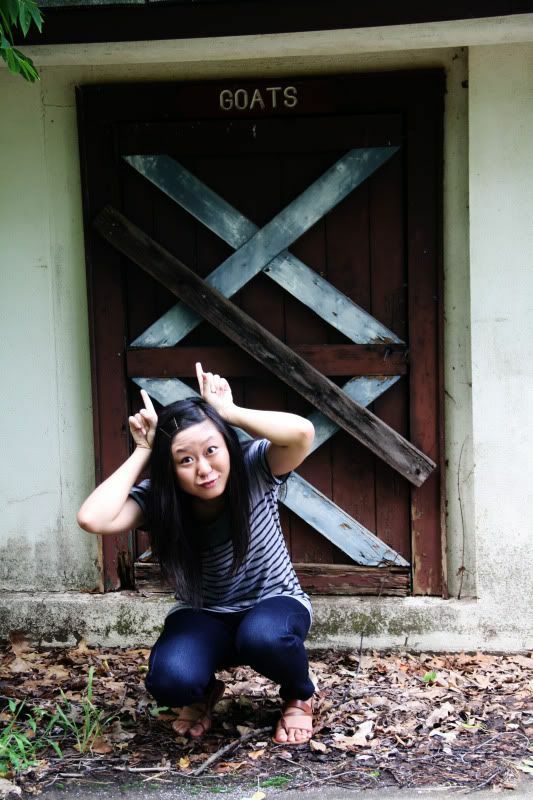 There were some old buildings and stables which made for some pretty interesting pictures. We eventually made our way to the right part of the park! However, since the weather forecast predicted thunderstorms the paddle boats weren't open for the day. It wasn't even raining by then but I guess rules are rules. The pond was looking pretty disgusting anyway. Maybe next time? I took my friend to Rita's Italian Ice after wards (it was his first time!) and I had me some delicious Peach and Lemonade! He chose Mango. I kept my look pretty simple this time around. The weather really does make me want to avoid any sort of layering sometimes. My bangs are also clipped up so I get more wind on my forehead! It's a rare look for me but it's refreshing from time to time. Every time I clip up my bangs, no one seems to recognize me! Oh, and I apologize for my silly looking face in some of these photos. The sun was all kinds of bright and it was hard to look at my camera. And the shoes you've seen in the first three remixes are the shoes I'll be wearing for the rest of the 12 looks! Yes, that's me. As a goat. yay we coordinated!! hehe we definitely are soul mates <3 when it goes on sale, i'm definitely getting this in grey too :) and how do you have yet another cute bow ring? i don't have any!! :( it's not fair!!! Here, let me toss you a tin can. Haha I have that same Gap shirt in other colors too! I love your hair pinned up, it's pretty! Oh I've wanted to go paddle boating here in SF but the weather's always too foggy and crappy to go. such cute pics, jen! lol the goat pose is my favorite:P have a great weekend! you ventured out in NYC with black jeans on?! You're crazy slash very brave :) I applaud your efforts. Meanwhile I was melting away this past week. Cute pictures, keep it up! You are the most beautiful and stylish goat I've ever seen! :D Haha. I love the fit of the shirt! 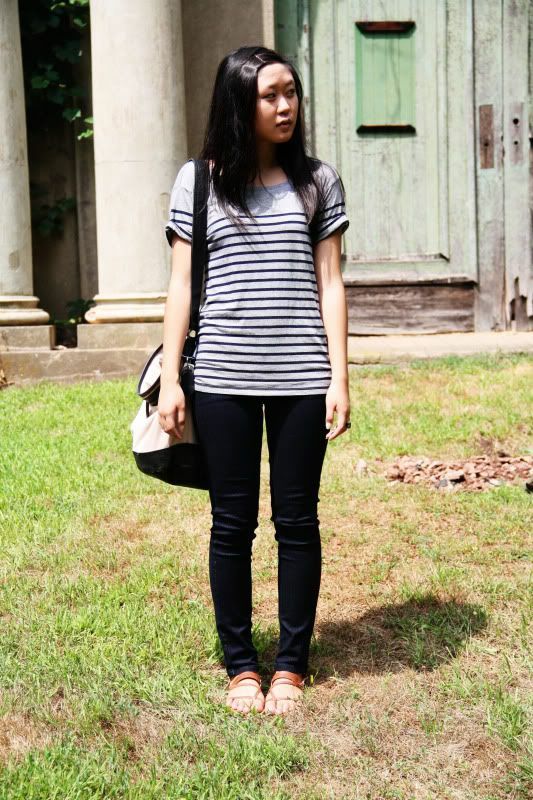 Lately I've been favoring loose tops with fitted bottoms--but I couldn't wear skinny jeans. They're gorgeous, but just not for my bod! Haha. Great outfit! Haha,crazy girl !Love the outfit, even tough I think you felt really hot in those jeans:)But the sandals are AMAZING ! Great look- the outfit I mean... You are super cute as a goat, but if I find out you have another blog called jenigoat, I might be alarmed. Hahaha, nice shots! I loved the last one :) You look great! Have a nice weekend! ahhaha that´s me as a goat!XD! Hahahah!! nice nice jeans!!! and sandals. hhahhahahahaha love the goat face! In conclusion, you look HOT. (Hahahhaha, PUN?! Get it?! HOT, as in good. But HOT, as in weather. (Not that you look weather hot. You don't at all. I look like a sweaty mess in all my pictures!)) I know what you mean about layering - summer just makes it kind of... not possible. Also, ADORABLE RING. And good luck to your photographer + his/her internship! Woooot. you are so cute! love the ring you're wearing. Jeans in really hot weather, not my kind of thing. But autumn's just around the corner for you guys isn't it? I'm just waiting for the rain and cold to go away here is Oz. this outfit is simple and I like it. Hi Jen ! You look lovely in that simple outfit ! Love your shirt :) Love the 15 for 15 idea ! Man you are brave to do skinny jeans in the heat! I lovvvvve paddle boating, but I can never find anyone to go with. so cute your bow ring!! 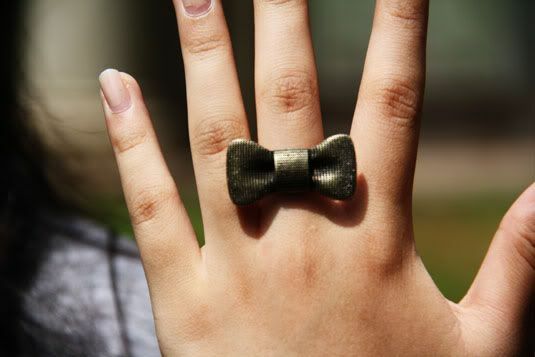 Love the bow ring, cute! JEANS, in 90F weather? Are you mad, Jennifer? Crazy. It's humid here, I could never wear jeans, no matter how thin. I dropped by H&M yesterday and found nothing as brilliant as that versatile shirt dress, and I walked out, disappointed and slightly nauseous from all the skanky A&F clad teens bearing too much leg. Lol, the last pic is so funny. Love the cute stripes and bow ring! adorable! You look so cute! I love the stripes and your sandals! I love it! Such a casual classic look. I've been loving your outfits lately. 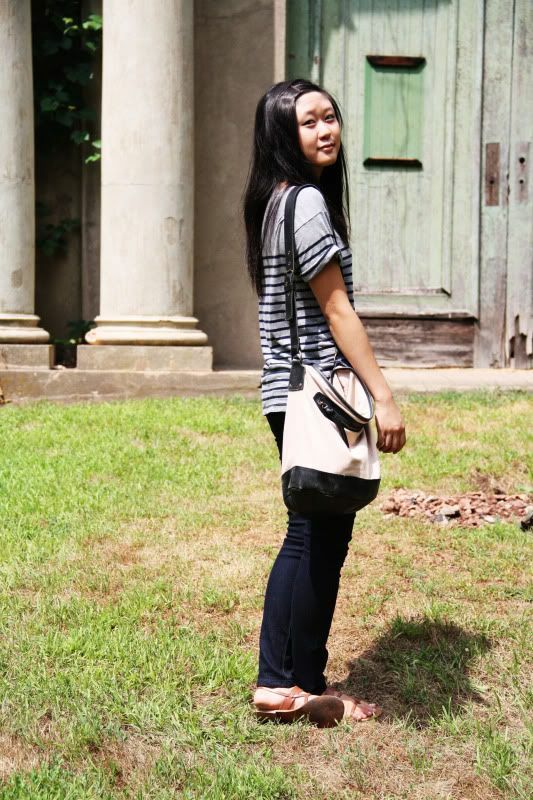 It's evolved into a simple, casual and classic look. I'm totally loving this casual look, Jenn! The jeans hug you perfectly and I love they balanced out the looseness from the shirt. I'm starting to dislike my bangs. They make my forehead sweat like crazy, especially in this weather. Urgh, I need a bobby pin! I love that ring - great pictures Jen!